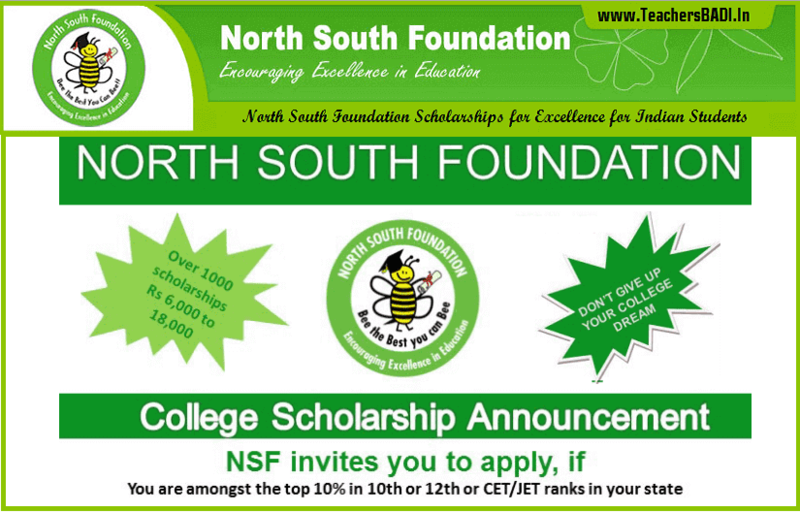 NSF/North South Foundation Scholarships for Excellence for Indian Students 2016: NSF College Scholarships-North South Foundation (NSF) provides scholarships to undergraduate students entering into engineering, medicine or 3-year polytechnic (diploma in engineering.) based on merit and financial need. NSF uses uniform eligibility criteria to identify meritorious students across chapters. The scholarship is an annual award and not a one-time payment. The student is eligible for the scholarship until graduation as long as he/she maintains high academic standards. NSF funds these scholarships by raising donations in the US. The local chapters located in various states in India do the commendable job of advertising to invite applications from students, screening these applications and selecting the most needy group of students who eventually become NSF scholarship recipients. Scholarship amounts range from INR 5,000 to INR 15,000 per student year. Eligibility criteria for NSF college scholarships are listed below: Apart from reviewing academic records and income statements, NSF will also review the special circumstances under which the student is submitting his / her application. No assistance is provided for students at the high school level and those at the graduate (Master's) level in this category of scholarships. 3. Applicants have secured admission to professional courses like Engineering, Medicine, Dental, Veterinary, B. Pharm, BSc Agri or Polytechnic in a GOVERNMENT COLLEGE (including seats in Government Aided colleges) and do not receive other aid or scholarships. To fill your on-line application you MUST have an email id. If you do not have an email id, you can create one on mail.google.com -> CREATE AN ACCOUNT. You need to remember this email-id and password for future use. Additionally, you will receive emails from NSF only at the email id you provide. Online registration of applications is a must. Applications which are not registered online shall not be considered for grant of scholarships and summarily rejected. must invariably be enclosed and submitted to respective chapters. 1. Bonafide certificate from the college, marks memo of the previous year/semesters, conduct certificate and fees paid receipt/s for the current year should be obtained and forwarded along with hard copies of renewal applications. 2. Applications not properly filled up and containing gaps shall be liable for rejection. Online registration of renewal applications is a must. 3. Conduct certificates duly certified by the Principal and passing of all subjects in one attempt without any backlog is a prerequisite for granting renewal scholarships. During 2016-17 it was stipulated that all the scholarship recipients should spend 80 hours in serving the poor through a registered NGO. While forwarding renewal applications the students should enclose. A certificate from the NGO that he/she had performed 80 hours of service to the poor giving full details about what the student did during the 80 hours. The student should also submit a detailed report on the experience gained during the Seva Programme of 80 hours.